It’s no secret that marketing, especially online marketing, is evolving quickly, with new marketing possibilities emerging almost every year. The newest opportunity in online marketing is called Messenger Marketing. And guess what? The possibilities it presents are huge. In this article, I’ll provide a short overview of the reasons why Messenger Marketing is the new way for online marketers. In addition, I’ll discuss the big advantages and offer some insights into how you can use it for your business. Mobile messenger applications have become a strong force in the mobile app sector. 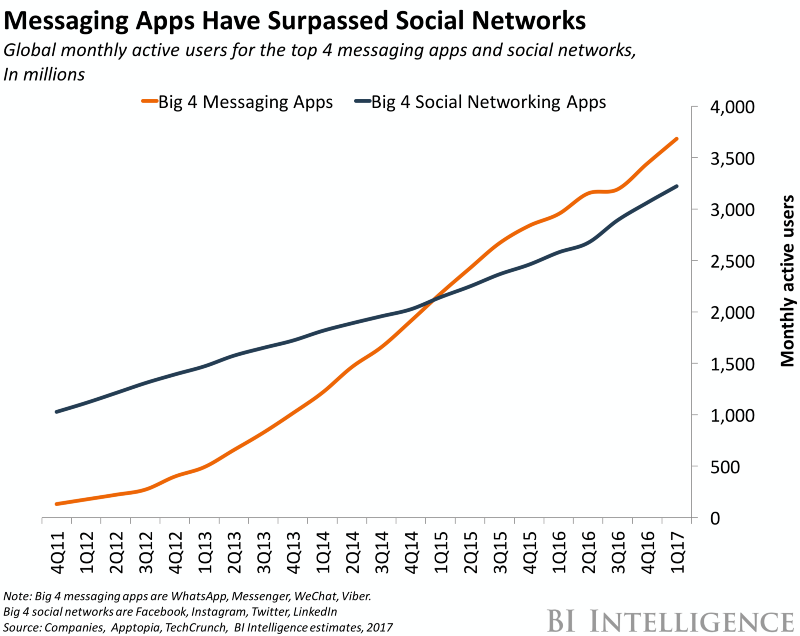 In 2015 the four big messenger apps surpassed the four biggest social networking apps in terms of monthly active users. 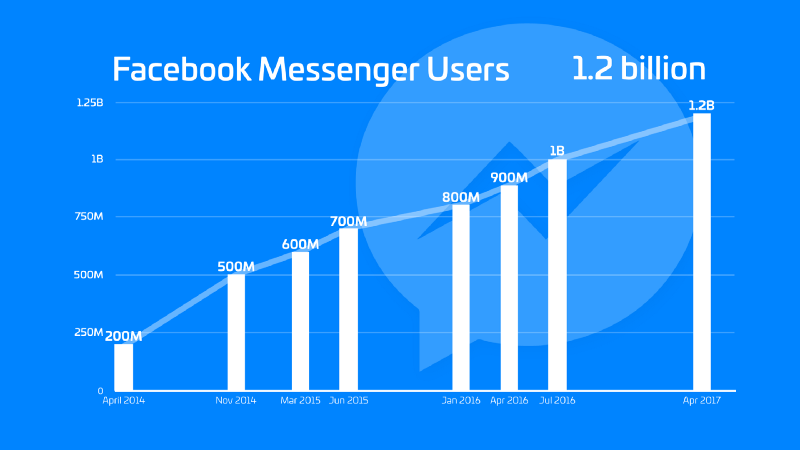 More than one billion people are using Facebook Messenger. What does this shift in application usage mean to companies, especially online marketers? It’s obvious, that the way we communicate with our customers must change. As a company, we must be in the places where our customers are having their conversations. Especially where they’re spending the most time online. Until last year, there was almost no opportunity for companies to reach customers inside chat. Then, in early 2016 Facebook launched its Messenger API (learn more) and the chatbot hype started to grow. Chatbots are automated services that can respond to humans within a chat. They are one of the hottest topics in tech and marketing, because they are completely changing the way businesses communicate with their customers. With the launch of Messenger, companies can now automate communication with their customers using chatbots within their Facebook pages. And Messenger Marketing has become the new way to reach your customers! The main advantage of Messenger Marketing over other online marketing strategies is that the users are spending most of their time online inside their messenger applications. That has an enormous impact on the probability of reach your customers. Another huge advantage is that the chat itself is not one-way communication, but two-way. You as a company are not just sending out a single email newsletter to the end user, instead you’re having a whole conversation in which you can react to users’ preferences and needs. That enables you to personalize your content big time. In the end, marketing is all about sending the right content/products to the right customers to fit their personal needs. Messenger Marketing is going to lift this to a new level. And don’t forget: chatbots are automated, so they’re available 24/7. First you need to build a subscriber list. You can compare that to a classic list of email leads. There are several ways to grow your subscriber list. One possibility is Messenger Destination Ads (like the classic newsfeed ad but with Messenger as the destination). We’ll talk about the possibilities in one of the next articles, so stay tuned. After you have your first subscribers, it’s all about getting to know them better. For example, a streaming service like Sky wants to know which subscriber are into which kind of movie/series genre. These personal interests could be gathered either explicitly by asking users inside your chat, or implicitly by analyzing the data in terms of how the subscribers communicate within the chat. And don’t forget, this is all automated by a chatbot. You’ll set it up once and receive information about every subscriber who enters your chat. Afterward, the exciting part about Messenger Marketing begins. You can segment your subscribers according to their preferences. For each segment, you can create new Messenger Marketing campaigns to send the best content to the subscribers who really want to receive it. A huge House of Cards fan is interested in when the next season will begin, so Sky can send important informations about House of Cards right into his Messenger. That has a huge impact on your customer engagement and thus, also on your sales strategy. If you’re interested in creating your first chatbot, there are several SaaS tools that can you help to build your chatbot within minutes. If you want to boost your marketing strategy using Messenger Marketing, chatchamp.com is a good choice to start with. They are enabling Messenger Marketing for business, and you’ll have a detailed analysis of your whole funnel, from growing your subscriber list to selling your product. Remember: It’s always about delivering real value to your customers. Jump on the Messenger Marketing train and send the right content to the right people.